Two years after its predecessor invented the large-sensor, long-zoom category, the Sony RX10 II is here to take things to the next level. It aims to replace your bulky interchangeable-lens camera with a veritable Swiss Army knife compendium of photographic features in a beautifully-crafted body. But the RX10 II is no longer in a class of one, and there's no getting around the fact that it is much more expensive than its rivals. Does it have what it takes to justify that extra expense? Find out now in our in-depth Sony RX10 II review! Available since July 2015 in the US market, the Sony Cyber-shot DSC-RX10 II carries a list price of around US$1,300. Although that's around the same price as the original RX10 at its introduction, it's quite a bit higher than rivals. The Panasonic FZ1000, for example, lists for only $800, a full $500 below the RX10 II. And the Canon G3X has a list price of US$1,000, still some $300 less than the Sony. Of course, while they're all large-sensor long-zooms, all three cameras have quite different feature sets, strengths and weaknesses. There's a lot more to the story than price alone, as you'll find out as you read through our full review! Special update: The Sony RX10 II was named Best Enthusiast Zoom camera in our 2015 Camera of the Year awards! The Sony RX10 II, then, lands in an entirely different and more competitive market to that which its predecessor first created. Yet take a glance at its exterior and you could be forgiven for thinking it was unchanged: Looking only at the body and lens of both RX10 and RX10 II, you'd be hard-pressed to find any difference between the pair. Underneath its skin, though, the Sony RX10 II is a far more powerful and capable camera than was its predecessor. In much the same way that Sony improved its RX100-series pocket cameras with the Sony RX100 IV, the RX10 II gets most of its new capabilities from the company's brand new 20.2-megapixel 1"-type Exmor RS stacked CMOS sensor with integrated DRAM, which allows for much faster performance. Autofocus performance is also much improved, now employing Sony's "Fast Intelligent AF" technology to allow manufacturer-claimed AF speeds as fast as just 0.09 seconds. In addition, the new Sony Exmor RS sensor provides electronic shutter capability up to 1/32,000 second, which comes in very handy when shooting in bright conditions at wide apertures. And Sony claims that the RX10 II shows little to no rolling shutter "jello" effect, thanks to the high-speed readout enabled by the fast, local DRAM. And where these high frame-rate modes impress most of all is in their relatively high resolution compared to other high frame rate-capable consumer cameras to date. All HFR video from the Sony RX10 II is output at Full HD (1,920 x 1,080 pixel) resolution, but that's after upsampling. Even prior to upsampling, though, 240p / 250p video is recorded at a surprisingly high 1,824 x 1,026-pixel resolution. Stepping up to 480p / 500p capture does degrade the quality quite a bit with a capture resolution of 1,676 x 566 pixels (approximately halving the vertical resolution), but it's actually still pretty usable. And even the highest-rate 960p / 1,000p capture has 1,136 x 384 resolution before upsampling. Apart from the Mark II badging, nothing has changed from the front to distinguish the Sony RX10 II from its predecessor. As previously mentioned, the optics of the RX10 II remain unchanged from its older sibling, offering the same excellent Zeiss-branded 24 to 200mm-equivalent zoom range, with both an f/2.8 constant aperture and Sony's SteadyShot image stabilization. 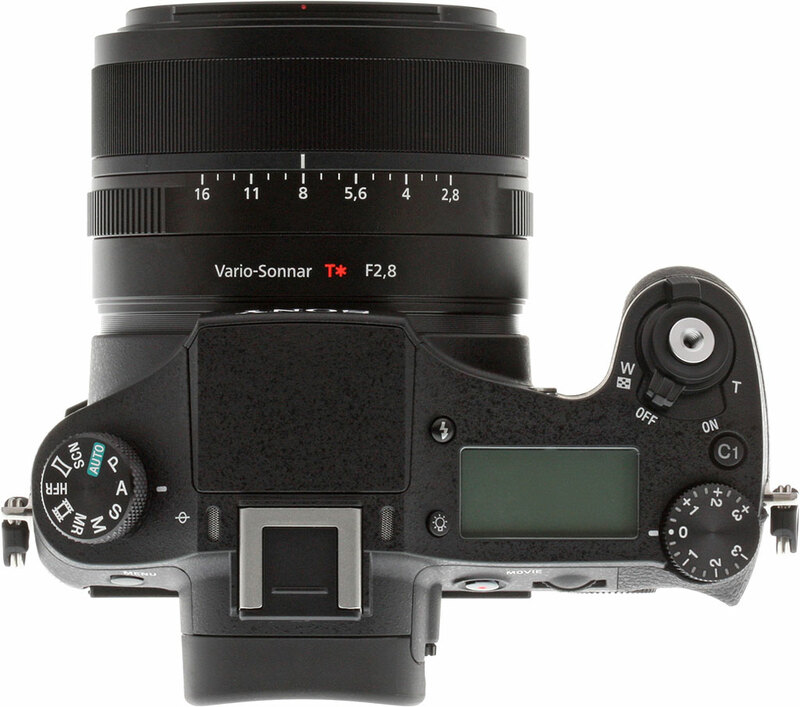 The top of the camera is very similar to the RX10 as well, though the mode dial now has an MR position capable of accessing up to 3 sets of custom settings instead of 2 dedicated custom settings. That freed up space to add an HFR mode setting for quick access to High Frame Rate video. 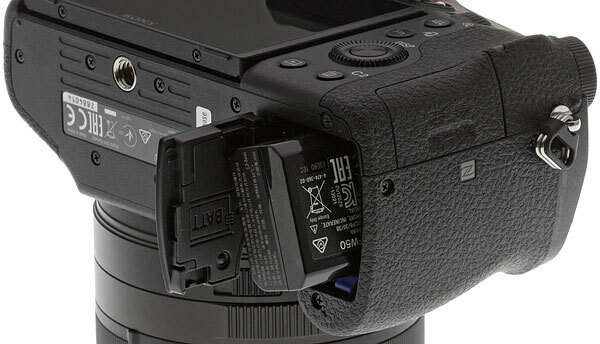 Also note the single Custom button on the RX10 is now labeled C1 on the RX10 II -- we'll see why in a moment. The Sony RX10 II's sensitivity range is similar to that of the original RX10, with the same upper limit of ISO 12,800-equivalent, which can be extended to ISO 25,600-equivalent when using Multi Frame NR. However, the base sensitivity is now ISO 100-equivalent versus ISO 125, and it's expandable down to ISO 64-equivalent versus 80 on the earlier camera. Of course, all of those pixels need to be processed by something. 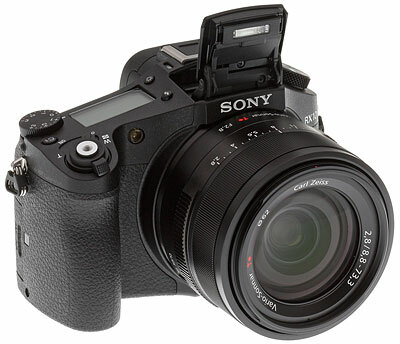 To handle the workload, Sony packed in its latest BIONZ X-branded image processor. And with all of that updated hardware also comes new firmware functionality. The Sony RX10 II now includes a more robust flexible spot autofocus function, a new self-timer duration of 5 seconds, and a longer shutter speed of 30 seconds when shooting in Program or Aperture Priority modes. Also added are new Picture Profile options for movies that let you precisely adjust black level, black gamma, gamma (including S-Log2), color mode, saturation, color depth, knee and more. For the RX10 II's electronic viewfinder, Sony has opted to use a new 2.35-million dot XGA OLED Tru-Finder display, almost doubling the dot count of its predecessor's EVF. Sony claims the updated EVF offers higher contrast and more natural color rendering as well, and although we didn't have a chance to try both old and new versions side-by-side, we'd certainly agree that it's a very impressive finder indeed. 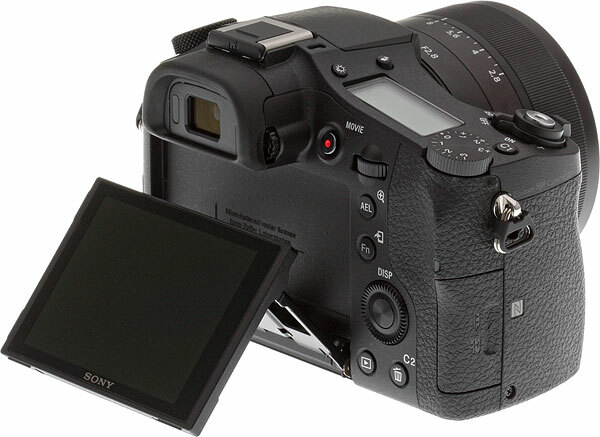 The tilting three-inch, 1.23 million-dot LCD monitor on the rear of the Sony RX10 II remains unchanged from its predecessor, as does the control layout. One change that's visible from the back, though, is that the Delete button has an additional C2 label, indicating it now serves as a second customizable button in capture mode. The Sony RX10 II uses the same NP-FW50 lithium-ion battery pack as did the RX10, but CIPA-rated battery life differs slightly, gaining in electronic viewfinder mode at the expense of arm's length capture. While the RX10 was rated for 420 shots using the LCD and 340 shots with the EVF, the RX10 II is rated for 400 and 360 shots respectively. And with that, let's dig into the meat of the review with our real-world field tests, lab test results and plenty more besides! Back in late 2013, Sony launched the RX10, a camera which promised to do the same thing for the long-zoom camera that its RX100-series had for pocket cameras. With a much larger than average 1"-type sensor, the RX10 could capture really great photos that were packed with detail. And while it wouldn't rival a DSLR or mirrorless camera in low light, the Sony RX10's bright constant aperture 24-200mm equivalent zoom lens would've required a hefty bag of glass to match with an interchangeable-lens body. I first got the chance to shoot with the Sony RX10 alongside the Sony A7 and A7R mirrorless cameras, and while their full-frame sensors ensured that the latter duo grabbed all the headlines, the long-zoom RX10 was the sleeper hit for me. 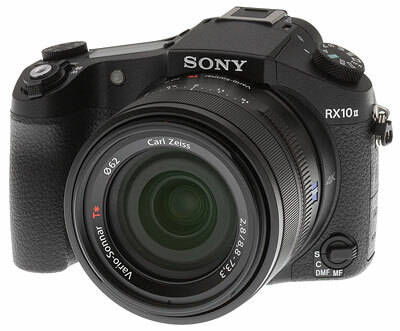 Nor was I alone in that assessment: We gave the RX10 our 2013 Camera of the Year award in the Enthusiast Zoom category. How does the Sony RX10 II shoot in the real world? A quick recap for those who've just tuned in! Just as did its predecessor a couple of years earlier, the Sony RX10 II packs a whole lot of camera into a solid and surprisingly compact body. It would take at least a few lenses to match the RX10 II's capabilities in an interchangeable-lens camera, and it's really quite freeing to shoot with something of not dissimilar size to an entry-level DSLR with kit lens, and yet not feel limited by it. The RX10 II still has the same quality feel and (for the most part) good ergonomics as did its predecessor. And its now even more of a pleasure than ever to shoot with, thanks to a superb new high-resolution electronic viewfinder, which truly makes manual focusing a snap. How did the Sony RX10 II perform on my night shoot? Below are crops from our laboratory Still Life target comparing the Sony RX10 II vs. the original Sony RX10, Canon G3X, Panasonic FZ1000, Olympus Stylus 1 and Nikon J5. These models represent the RX10 II's direct predecessor, both of its closest rivals, an enthusiast-grade long-zoom camera with constant-aperture lens but a smaller sensor size, and a very compact mirrorless camera with the same sensor size. What will those photos look like up on the wall? 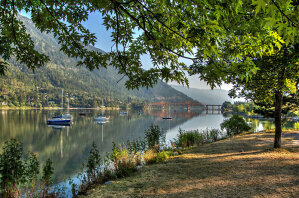 ISO 64/100 prints show impressive detail and pleasing colors all the way up to 24 x 36 inches. Even with larger 30 x 40 prints, there is very little visible pixelation from this 20-megapixel image, making this size just fine for wall display. ISO 200 images show a hint of shadow noise, but detail and colors are otherwise excellent, making for a great 20 x 30 inch print. We'd be fine with a 24 x 36 print for wall display here, too. 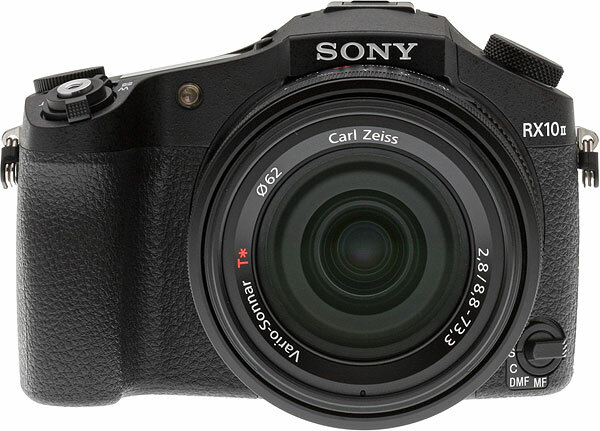 2013's Sony RX10 was a camera that went unrivaled, a fact due in no small part to the fact that it had no direct rivals. The closest alternatives were a long-zoom whose image quality was crippled by its smaller sensor size, or an interchangeable-lens camera which couldn't compete on size and weight -- at least not if you wanted the same focal length range and bright f/2.8 constant aperture. But time has moved on, and two years later that is no longer the case. Where the original RX10 launched into a market of its own creation, the Sony RX10 II must now do battle with cameras from both Panasonic and Canon. There's no question about it: The Sony RX10 II is an even better camera than ever before. The same great body, lens, and resolution are retained, but 2015's model focuses faster, shoots faster for longer, has an even more enjoyable viewfinder and -- for those who favor using that finder -- even boasts just slightly better battery life.